We put in at the Bay Front Park in Daphne again. It was about 9am when we started and it was already warm. The water, however, was much cooler than our last trip. The cool didn't last long. While we were unloading the boats, we were rejoicing that there was a pleasant breeze, but it must have been limited to the land, because once we were on the water there was no wind whatsoever. There was no respite from the hot sun . . . no clouds, only a hazy sky and no breeze. The water itself was so calm there wasn't even any splash coming back up on us. The only way we could cool ourselves off was to toss the water onto ourselves periodically. The water was fairly flat and we could barely discern the gentle current crossing our boats toward the shore. It wasn't really work to go against it, but it didn't give us any advantage either. We paddled south for about twenty minutes before we decided to stop for a water break and rest a few minutes. We weren't really tired, but I was getting hot. It felt good to put my feet off the side of the boat and let them dangle in the cool water. After a while we started again, continuing south. We went on until we had paddled about 2 1/2 miles, then we headed back. I had noticed after we had left the house that I had forgotten my camera. At the beginning of the trip I figured it was just as well. The hazy, cloudless sky didn't provide much incentive to snap a picture, neither did the still water. The birds, however, always amaze me enough to try and capture them on film. I had decided to just not try any pictures until we were on the way back and I saw the remains of an old boat house reflected in the still water, the pelicans perched all around it. I thought it was worth trying to get a shot with my phone. I couldn't even see the screen with the brightness of the sun on the water, so I am surprised it turned as well as it did. As soon as we headed back we were greeted with the sweetest breeze. It had not been enough against our backs to either push our boats, or cool our bodies, but now with it in our faces, it was delightful. We were going against the current, which the wind had kicked up a little more. The strange thing is, even though our boats were going against the direction of the current, when we paddled, our paddles were going with the current, which may explain why it seemed so much easier that before. We certainly made better time. . .that is until we hit the mud. It wasn't literal mud, but the water felt like mud. I don't know if it was because we were getting so hot, or if the current was stronger than it looked on the surface, but all of a sudden, the last ten minutes perhaps of the trip, we both had the distinct impression that Mobile Bay had just turned into a huge bowl of jello and we were trying to navigate through it. I was delighted when we rounded the little beach cove and the put-in was clearly in sight. By now I was very hot. I felt like my face was a red as my kayak and looking in the mirror once we reached shore confirmed that fact. I was ready to be off the water and some place cool. 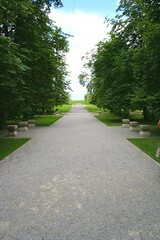 We had planned to change clothes there at the park and go to lunch at a place we had noticed nearby. I downed a whole glass of ice water in record time as soon as we arrived. Except for the last few minutes, it was a great trip. We paddled continuously for quite a while, which is good. . .I need the conditioning. We also noticed a new place to put-in which we might try on trip # 47. I love them scrambled. I love them fried, over easy. I love them boiled. I love egg custard. I love egg salad. I love souffles. I love eggs crumbled over my green salad. 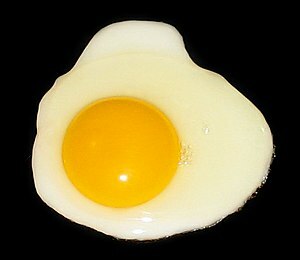 I absolutely love eggs. So does my beagle. When I eat eggs in the morning, (usually a boiled egg) she expects to get a bite! The thing I love most about eggs is what a beautiful picture they are of the trinity. The unfertilized egg is one cell . . .yes, one cell, yet it is comprised of three distinct parts, the shell, the yolk and the white, or albumin. The three parts are very distinct. One would never try to eat the shell -- at least I hope not. The yolk and the white have very different textures and tastes, just ask my beagle, who definitely prefers the fatty yolk to the protein albumin! Yet, the structure is one cell. My brain has trouble wrapping around such a concept, but I accept it to be true because those who know much better than I tell me so. Our God is one God. . .the Scriptures clearly state this fact. "For I am God and there is no other," (Isaiah 45:22.) They also state that our God is God the Father (John 6:27; Romans 1:27; 1 Peter 1:2), God the Son (John 1:1; John 1:14; Romans 9:5; Colossians 2:9; Hebrews 1:8) and God the Holy Spirit (Acts 5:3-4; I Corinthians 3:16). Three parts of the trinity, equal and yet one God. It is even harder for my brain to wrap around this concept than with the egg, but the Scriptures say it is true and I know them to be true above all other authorities in my life. I will believe the Scriptures when everything else in my world rails against them because they are the single authoritative text in my life. So the next time eggs show up on our plates, let us use that as a time to thank the Lord for the marvelous mystery of the Trinity, which only He can understand. Let us thank Him for His presence in our lives as God the Father, as God the Son and as God the Holy Spirit. And let us also thank Him for creating the eggs. Today my husband gave a devotional to a Men's Prayer Breakfast the topic of which was that we are never alone. As Christians, we never exist as simply "I", because the Lord Jesus has come to live in our spirits. Therefore, there is never a situation in our lives that we will face by ourselves. We will always face them with Him. He promised "I will never leave thee, nor forsake thee," (Hebrews 13:5). It reminds me of a situation I encountered over two decades ago. I was in a work environment that had become very difficult for me. I was being made to work a shift I was unaccustomed to, with coworkers I was not used to working with. I was essentially the "odd man out." I felt so alone and friendless, but I was also eight months pregnant. Because of my pregnancy, each time I would walk into work, I knew that I carried my own little friend with me. It was like having a "secret friend" no one else knew about. She was with me everywhere I went and I would frequently talk to her when no one else was around, like during those quiet minutes when I ate my lunch alone. I knew that no matter how ostracized I felt from the coworkers who didn't want me on their shift, I had a "friend" who was there with me no matter what, because she was in me and she wasn't about to leave me. . .yet. The truth of the matter was I had an even greater friend than my daughter with me during those days. That was the single most important truth that got me through those difficult days -- days that proved in so many ways to be the working of the Lord in my life for good. He was with me every step of the way, working out His eternal purpose. He was in every situation, in every moment, and I never had to face a single second of it alone. If I felt alone, it was because I did not make the choice to believe that He was there with me all along. Whatever moment is facing us, whatever bend in the road we see ahead, let us not face it with fear and anxiety, but with the realization that as Christians we are never alone on the path. The Lord Jesus walks the path with and in us. He will never leave us, He will never forsake us and it is His will to perform the good work He has begun in us. When we walk with path with Him, there is nothing to fear. The first trip of the season this year was about as perfect as one could wish. We put in at the Bay Front Park in Daphne, AL and headed south toward Fairhope. We did not reach Fairhope. Taking the whole winter off from exercise has taken a toll on my endurance but I am committed to regaining what I have lost. While my performance was disappointing, the day was not. It was warm but not hot. It was cloudy enough to give shade, but not overcast. It was sunny enough to be bright, but not blistering. There was breeze, but not so much as having to fight the wind to paddle. The water was cool but not cold. We paddled along the shoreline but far enough out to be out of the way of the piers and those fishing from the piers. 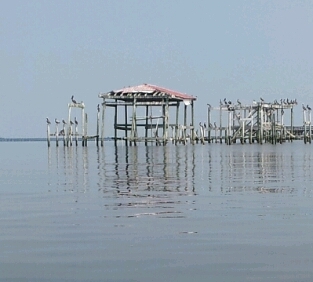 We were greeted by a host of pelicans perched on old pilings. As we paddled by them, I was amazed at their size and at how easily they took flight considering their size. We paddled down for over a mile and then stopped to just chat and enjoy the water and the beautiful day. The tide was changing and the current slowly pushed us back toward our put-in. Since we had started late in the morning, we didn't want to stay out in the sun for too long, so after a while, we began the paddle back. It rarely seems to happen this way, but it was so nice to have the current with us, it made the ride back a joy. We stopped at a beach on the way back to stretch our legs and walk out on one of the piers that is part of the Bay Front Park. We enjoyed looking at the water we had just traveled over and planning the next trip. Soon we were lining ourselves up to paddle back up to shore and carry our stuff back to the car. What a wonderful way to start the season! I don't know how many times I kept saying, "I love being on the water!" The day left me looking forward to the next trip, the next day, the next wonderful time kayaking together. I consider this to be such a great gift the Lord has given me in my life, the joy of kayaking with my husband -- and with friends who have joined us over the years.